When an animal, such as a rabbit, urinates on your lawn, the nitrogen in the urine reacts with the grass creating brown spots, called grass burn. If you have a wild rabbit visiting your yard or you have a pet rabbit you allow to access to your lawn, neutralizing the urine helps protect your lawn from unsightly brown patches. Rabbit urine also carries a strong ammonia scent. Knowing the proper steps to neutralizing rabbit urine allows you to restore your lawn to lush green and removes the noxious smells from your property. Neutralize rabbit urine using items from around your home or your local garden supply store. Spray the area where the rabbit urinated using a garden hose as soon as possible. Saturate the area to dilute the urine and wash it away. If you are unsure of where the rabbit urinated, spray down the entire yard after spotting a rabbit in your yard or taking your pet inside. Spray the area a second time 3 to 4 hours after the first hosing to further wash away the urine. Wait until the first water application is absorbed into the ground, before rewashing the area. 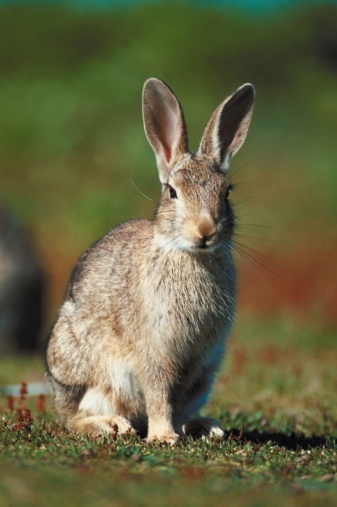 Sprinkle gypsum or lime around your yard where you see the rabbit most often. In the case of a pet rabbit, sprinkle the gypsum where you let the rabbit play. Gypsum encourages better soil quality, which in turn helps with the browning. Spray sidewalks and mulch areas with water to dilute the urine. Once the water dries, spray the area with a solution of 50 percent water and 50 percent white distilled vinegar to neutralize the odor. Do not spray the mixture on grass or plants. Removing the odor of the urine discourages other rabbits from visiting that area, eliminating additional urine spots to treat. Erin Ringwald began writing in 1998. She runs her own party planning business and helps with her husband's photography business. She's working on her Master of Education with a focus on elementary education and child development. Ringwald studied musical theater and later obtained a Bachelor of Arts in English literature from Wright State University.